Kingshay's own Dairy Consultant, Paul Robinson is based in the North of England, working from his home in Yorkshire. With extensive farm management experience, a BSc in Farm Business Management and a strong practical farming background, Paul has a wealth of experience and knowledge to provide down to earth practical farming advice tailored to your business. 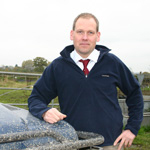 In January 2009 Paul was awarded a Nuffield Scholarship to study fertility in high yielding dairy cows. Paul is fully trained as an assessor for our How’s My Herd service.